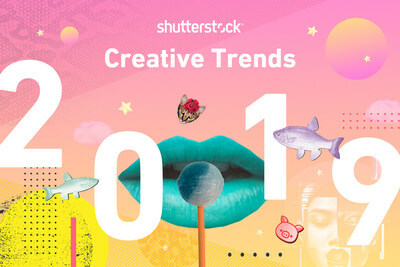 NEW YORK, Jan. 15, 2019 /PRNewswire/ -- Shutterstock, Inc. (NYSE: SSTK), a leading global technology company offering high-quality assets, tools and services through its creative platform, today launched its eighth annual 2019 Creative Trends Report. This year's eleven design styles, many of which echo the past in a playful and in a decadent way, predict the top influences for design and visual production in 2019. Zine Culture- The raw, homemade aesthetic gets a digital update. With a 1376% increase in searches for "contemporary art collage," zine culture clearly lives on in the decentralized mindset of the digital age through social media, where independent makers can share and niche groups can discover. Built on principles of collage and largely influenced by the invention of the photocopier, it is paper cutouts, noise and grain textures, and rough-edged layers that define this trend. 80s Opulence- The '80s are back and ready to party. The term "chain print" is up 731% and "elegance pattern" searches increased 1060%. Forget good taste, this is about good times. Clashing is the key word for this trend. Think leopard print (up 167%) and snakeskin (up 157%), peacock feathers and gold chain belts, soft fur and hard metal textures. Yesterday's Tomorrow- What's old is new again. With interest in terms like "Synthwave" increasing 717%, "Retrowave" up 676% and "Duotone" up 230%, this trend is an optimistic redux of early-tech – a focus on what yesterday's tomorrow looked like. It's all about the looks and sounds that defined futurism at the dawn of the digital age like bold purple, blue, and pink duotone gradients, basic vector graphics, and dreamy synth music. "Even the most talented creative professionals sometimes want a little inspiration for their next big project and our Creative Trends report is here to help," said Lou Weiss, global Chief Marketing Officer of Shutterstock. "With over 1.5 million fresh new assets added weekly and millions of searchers using our platform, Shutterstock has the volume of search and download data to predict the hottest trends and newest fads being driven by the design world. We can't wait to see these 2019 design themes come to life everywhere, from ad campaigns, to the catwalk, and in movies. This year, our top three trends are influenced by the bold design principles of years past, so it will be particularly interesting to see how they evolve with modern interpretations best suited for today's digital platforms." In addition to the top trends, the report outlines eight rising stars; some are joyful and made for escapism such as "Tempting Typography" and unique "Kawaii" illustrations, while others put reality into sharp focus including the urgent issue of "Beyond Plastic." Global Trends outlines the fastest growing trends in 20 countries around the world with "Colorful Cartoon Art" dominating in the U.S. and "Intelligent Space" in the U.K.
Shutterstock's global customer base of over 1.9 million creatives include designers, art directors, marketers and filmmakers whose search behaviors and download choices help forecast trends in the advertising, film, and media industries. The data gathered and analyzed across images, video and music includes billions of searches and downloads within Shutterstock's collection of 225 million images by customers around the world. The year-over-year search increases provide insights that are not only helpful for other marketers as they prepare for campaigns throughout the year, but also valuable to artists, photographers, videographers and musicians all over the world as an inspirational guide for creating new content for the Shutterstock collection. Explore the full 2019 Creative Trends Report here. Shutterstock, Inc. (NYSE: SSTK), directly and through its group subsidiaries, is a leading global provider of high-quality licensed photographs, vectors, illustrations, videos and music to businesses, marketing agencies and media organizations around the world. Working with its growing community of over 550,000 contributors, Shutterstock adds hundreds of thousands of images each week, and currently has more than 225 million images and more than 12 million video clips available. Headquartered in New York City, Shutterstock has offices around the world and customers in more than 150 countries. The company's brands also include Bigstock, a value-oriented stock media offering; Shutterstock Custom, a custom content creation platform; Offset, a high-end image collection; PremiumBeat, a curated royalty-free music library; and Rex Features, a premier source of editorial images for the world's media. For more information, please visit www.shutterstock.com and follow Shutterstock on Twitter and on Facebook. © 2019 PR Newswire. All Rights Reserved.